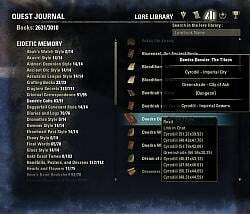 @Sianni / @GankisKhan: That isn't a bug, it is simply because ZOS placed multiple instances of the same lore book to make it easier/more likely that the player will find atleast one of them. Each lorebook usually has 3-5 locations within a zone. The exceptions are DLC and chapter zones so you may see a book there that you already collected in its original zone. @BrightOblivion: I too suffer from the lack of Invitation to the Kinlady's Conference & Sapiarch's Recommendation. As for The Sunless Hollow book, yea it has a location for each alliance, tho I'm not sure I have all three locations. Also, I thought I had marked it with the associated quest but it appears I did not. Last edited by Kyoma : 04/11/19 at 03:42 AM. Just wanted to mention that I am experiencing the same problem report in this topic here. I am a new player that started in Vvardenfell for the free event (still there). This addon worked for about a day, then I noticed suddenly all books were missing from the map. When I adjusted the addon settings to display collected books, all the books appeared, however the status is "collected" even though I haven't collected them (many areas I have not traveled to). It appears this is happening because many of the books now show with duplicate titles. I'm not sure what caused this but it was pretty recent. Any thoughts? I just want to say that, as someone who's hunting for every single book they can come across, but who missed the brief window when Rhanbiq's Notes, Invitation to the Kinlady's Conference, Writ of Valid Credentials, and Sapiarch's Recommendation were in my inventory (in no small part because there was no indication outside of that part of my inventory that they were there and should be read), I just wanted to say that the very prospect of this beta feature is incredible. Now, if ZOS actually manages to give post-quest locations to the books we've been pointing out for months on end, that would be truly amazing. I found that a book that is supposed to be in Stonefalls (The Sunless Hollow) is showing up in Auridon. The reason it's showing up there is because that dungeon (The Sunless Hollow) has a version in Auridon, Stonefalls, and Glenumbra, similar to the Harborage, due to characters from each alliance having their own, albeit similar, path through the Murkmire prologue for that first quest. All 3 versions would then have a copy of that book within them so that members of those alliances can obtain them as well. TL;DR: That's supposed to happen. It's okay. Last edited by BrightOblivion : 04/04/19 at 12:48 PM. Wasn't showing on my map, and was last one in Summerset for me. 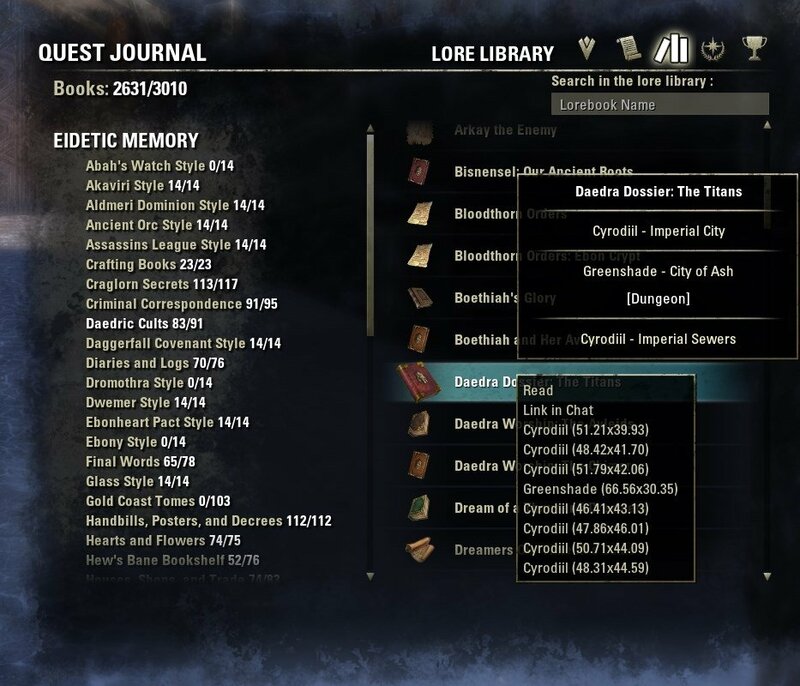 Since I want to use the beta feature and not miss any eidetic memory books whose location is solely within the inventory during a quest and yet not miss out on any dialog when the books open, I fiddled with the lorebooks.lua file a small bit. I made a single line change to the function starting on line 2070. It works for me. 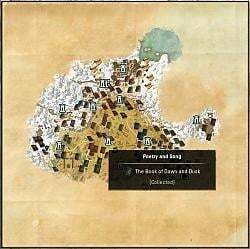 Perhaps you may wish to offer an option of automatically attempting to read the book or to just drop a line in the chat box letting the user know that they may wish to check their inventory for a readable book. Good idea actually, will add/change that option. in the north, way out of the borders of the drawn area of the map. 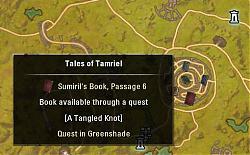 there is actually a "fixed location of the book anywhere in Craglorn"
or if this book randomly found in bookshelves ? Does anybody know something about this book. At least the location on the map seems to be wrong. Instead of having the beta feature to automatically read / use added lorebooks during quests. Could there be a notification sent instead? I tried the feature and it would cut off the dialog and open the book as soon as obtained. Some dialogs could not be accessed again in order to hear / read what they had to say. Plus with a notification there would be a reminder to check for books that can be read. 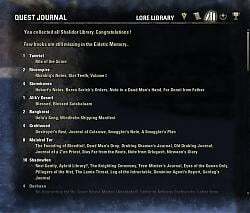 Too often I forget to check inventory and find out later that there were quest only books that I had missed. 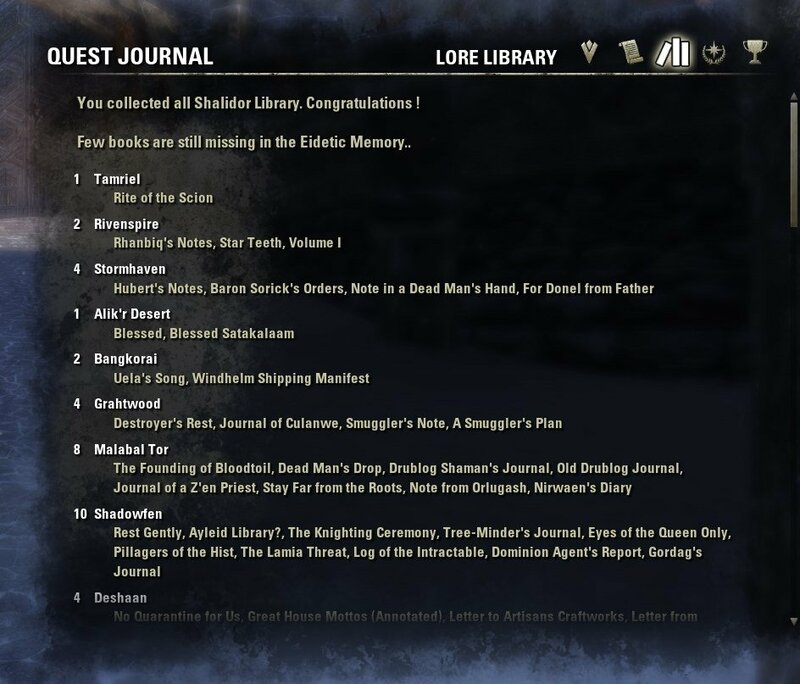 I recently noticed that if you go into the thieves den and dark brotherhood sanctuary that the pins for the lorebooks and eidetic memory don't show up at all. If you are outside of either place you can see the markers in the general vicinity on the zone map. I am not sure if this is solely isolated to these locations. I kept getting errors but it turned out that Minion failed to detect that it needed updating. Minion displayed 14.1 and that it was up to date, but the files themselves were last updated February 28th and LoreBooks.txt still said "Version: 14". Right clicking and choosing "reinstall" forced it to update, but it's weird that Minion failed to detect that "14"!="14.1". It makes me wonder what Minion's actually doing if it's not looking at the .txt files for version numbers. I just wanted to say thank you for keeping this add-on up to date. Cheers! Thanks for the great work anyway ! It's a really really useful add-on. Well I've updated it anyway, deal with it!